"How much is it, this year, my man?" The tailor had come in while he was speaking. "Well, it's been a doubling so many years, you see," the tailor replied, a little gruffly, "and I think I'd like the money now. It's two thousand pound, it is!" "Oh, that's nothing!" the Professor carelessly remarked, feeling in his pocket, as if he always carried at least that amount with him. "But wouldn't you like to wait just another year, and make it four thousand? Just think how rich you'd be! Why, you might be a king, if you liked!" "I don't know as I'd care about being a King," the man said thoughtfully. "But it dew sound a powerful sight o' money! Well, I think I'll wait--"
"Of course you will!" said the Professor. "There's good sense in you, I see. Good-day to you, my man!" "Will you ever have to pay him that four thousand pounds?" Sylvie asked as the door closed on the departing creditor. "Never, my child!" the Professor replied emphatically. "He'll go on doubling it, till he dies." 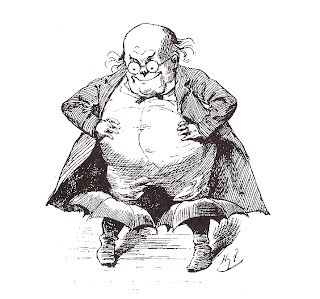 About the image: The Professor by Harry Furniss, for Sylvie and Bruno.